← Should a Sniffle Keep Visitors Away from the Elderly? While most people get excited for the winter holiday season, it can also be a time of great loneliness and sad feelings. This is especially true for elderly people. Usually due to health issues related to age, many senior adults are somewhat socially isolated. When they contrast their lives with how they used to celebrate, or remember friends and family members that have either passed away or live far away, seniors can amplify those lonely feelings. Family caregivers can do a lot to ease holiday loneliness for their senior loved ones. Studies show that social isolation is growing more common in the country’s elderly adults. That’s because medical advancements are keeping people functioning in their homes for longer. It’s also due to grown children moving far away from their elderly parents, and to the natural isolation that diminishing physical and mental health brings. Prolonged isolation has been linked to all kinds of health problems in elderly people, such as fatigue, depression, chronic illness, earlier onset of dementia and even death. Because of the focus on family and friends and happy times during the winter holidays, many seniors feel even more isolated than usual. Family caregivers can do their part to ensure their aging loved one feels included and gets to participate in as many fun holiday events as they can. Family caregivers can often incorporate and senior relative into their winter holiday celebrations, whether they observe Christmas, Diwali, Hanukkah, Ramadan, Kwanzaa or something else. Many seniors are simply looking to create meaningful connections and get some social stimulation. For many elderly people, worship services are important, so family caregivers can arrange for transportation to key events. Others would love to attend concerts, performances or cultural events that highlight the holidays. 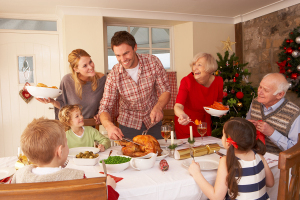 If there are certain traditions, such as food or music, that bring meaning and joy to a winter holiday, caregivers can do what they can to incorporate those into a family celebration. More than anything, most elderly people simply want to connect with friends and family. Caregivers should also check out what is available for seniors in the community during the holidays. Key resources include senior centers, community centers, nearby religious groups and congregations, and more. Many of these kinds of celebrations are free or offer reduced prices for seniors. Caregivers should check the venue for appropriate accommodations for elderly people with mobility issues, such as walkers or wheelchairs. Even if the elderly person is bedridden, family members can do a lot to bring the holidays to the home by hosting family gatherings there, arranging for phone or video calls with loved ones, and bringing a festive atmosphere inside with music, food and decorations. It doesn’t take much for family caregivers to include senior relatives in their holiday celebrations. Winter holidays are fun for all ages, but they can be incredibly lonely and stressful times for elderly people. Instead of being something to dread, the holidays can quickly become a time that aging adults look forward to every year.